So what will Firefox do now we’ve got to version 10? Another update today of Firefox. But what’s this? 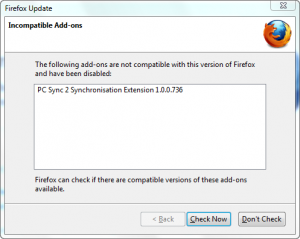 What on earth is PC Sync 2 Synchronisation Extension? I would’ve googled it but there was a hole in the bucket, so I switched to another PC and binged it instead. It seems it’s a Nokia thing, and not a particularly popular thing either. Installed itself without asking, and doesn’t want to be deleted. Ah well, the Nokia goes in the bin in May. Good Riddance.